Editor's note: July 4, 2013. We received the following letter today written by the grade-eight daughter of an Egyptian friend iiving in Cairo. We felt that she conveyed her reaction to the political events taking place there with such raw grace and passion and intelligence that we immediately asked for permission to republish it (unedited) here for you. We look forward to hearing your thoughts. Being at this young age does not make me this girl who thinks she knows everything, it makes me someone that is trying to believe in my country and trying to learn. I am fully aware that my opinion is an impact by the people around me and that I am way to young to form my own outlook to all of this. You can’t blame me for that. I am still trying to comprehend everything that is happening and my brain is not mature enough to make and set me own opinion towards Morsy. Morsy hasn’t hurt me as I child. What do I know! I am not handling the family money; I am not the one who deals with the finance problem, that’s my parent’s job. And apparently they weren’t happy about Morsy’s help with it. So we so called ‘rebelled’. However let me tell you something, an amount of people so big trying to say something is not rebelling: its taking your rights and taking what was yours. My dad told me today that for the past two years, he felt that he was just running away from everything, but today; he stopped and he took a break. He was so proud of his country that it achieved. I have to admit it, for the past several months I was not proud of being called an Egyptian. I thought as soon as I would tell someone this, they would just give me a dirty look and walk away. I just stared at the mirror and would say “Not Egypt, no this is not were I will raise my kids.” And I made that my final decision. However on the 30th of June. The smile that came across my face was huge. I couldn’t believe the hope and faith that the Egyptians had! All this energy and happiness was over whelming. But what really was a closer for me were the cooperation and the unity that happened. I mean look what we have accomplished in a calm manner in just 4 days. I could now walk in the street with a sign on my forehead saying, “I am Egyptian.” In my life I have never had this change of heart towards anything. But you know what, being Egyptian is a dream comes true. We did it right this time, the steps we are taking so far are huge steps that will bring us all to happiness and settlement. When I walked through the protest on the 3rd, all these cheers and honking and dancing! They were celebrating, they were happy. Happiness is very rare to find, but once you find it you will never loose it. It will always give you faith in life. I have never been more proud to call myself Egyptian, I would want nothing else but for people coming and asking me about my journey as a 12 year old and how I feel towards all this. I would love to tell my story more than anything, everyone’s story has a right to be heard. This is all just a lesson to us, it shows us that you need to prove yourself and show us this strong ability you say you have to rule such a fine country. We now know that we must be careful no matter what. This whole movement proves that all you need to do is trust in God, give hope and faith, and finally stand up for your rights. And ISA all God will do is help you find your path. 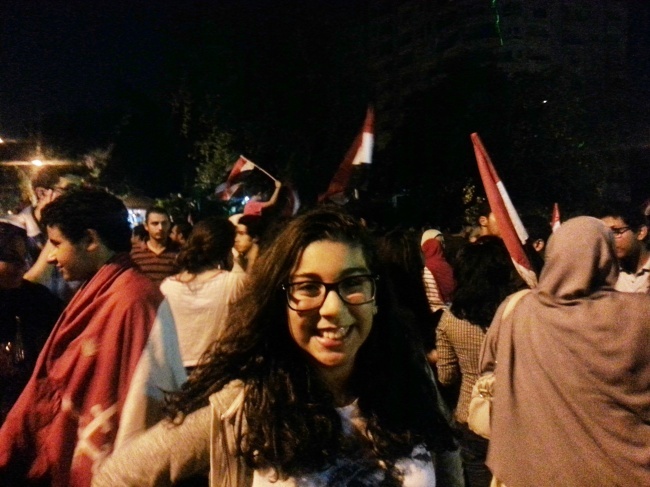 Omnia is a grade-eight student at Hayah International Academy in Cairo, Egypt. Her parents are co- founders of Gateway To Egypt, a sustainable travel provider operating responsible travel to Egypt and other destinations across the globe. She invites everybody to come and visit Egypt as soon as possible when the dust settles!